Madrid - Tens of thousands of people from all walks of life hit the streets of Spain on Saturday in a "Citizen's Wave" anti-austerity demonstration. As part of the ongoing and neverending protests all over Spain against austerity measures and budget cuts in the country, the latest event saw tens of thousands of people in the streets of Spain, carrying banners, banging drums, blowing whistles and hooters and generally making their anger known. 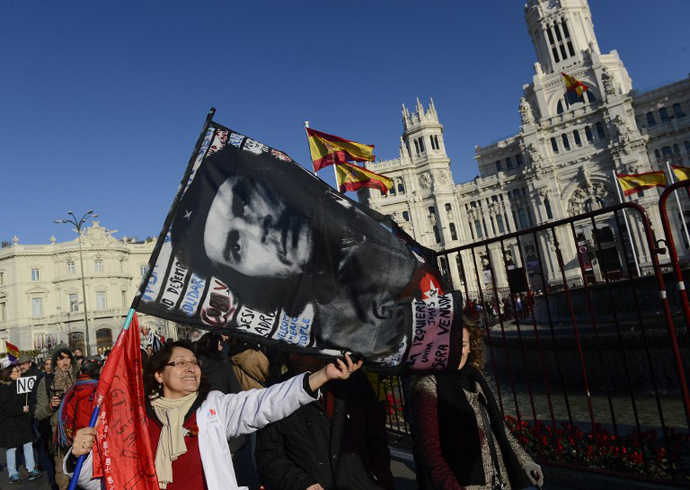 One woman carried a flag depicting Argentinian-born Cuban revolution hero Che Guevara. Others carried posters just saying a simple message, "No" or "No dictatorship." A firefighter carried a placard reading, "If there is no justice for the people, there will be no peace for the government." The people of Spain have had enough of the hardship brought on by the financial crisis in the country, along with what they call the corruption of the government, referring to the recent scandal involving Prime Minister Mariano Rajoy and slush fund payments. While thousands marched countrywide, possibly the biggest demonstration was in the capital, Madrid, as thousands marched on the Spanish parliament, targeting the "coup of the financial markets." Many have been badly affected by public sector cuts and tax hikes introduced by Prime Minister Mariano Rajoy’s conservative government, launched to tackle the country's debt problem. According to Rajoy, these measures have been imposed to cut a "path for the future", but the Spanish public disagrees. The people say that the "pressure of the financial markets" along with government corruption have led to the current situation and that because of this, the people are being punished, not those actually responsible for the crisis. Unemployment continues to soar at 26%, with 50% and more among the youth. The protest has been dubbed "Citizens' Wave 23F" and includes workers from virtually every field including professors, teachers and students, doctors and nurses, miners, political activists, firefighters and environmentalists. The current protest marks the 32nd anniversary of a failed attempt by right-wing officers to overthrow Spain's new democracy and restore military rule. 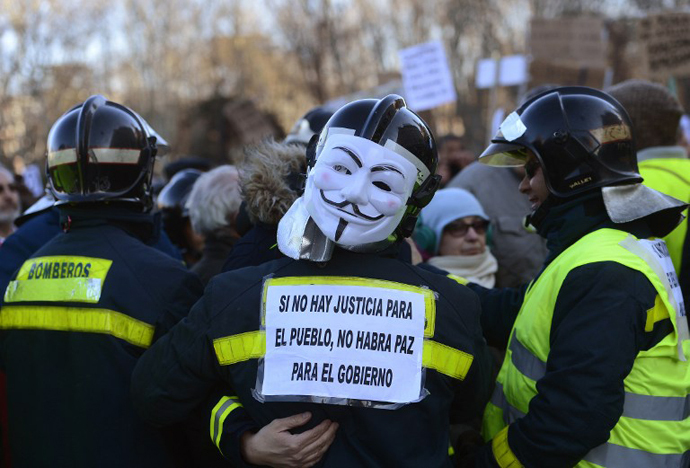 People from all walks of life protest in the 23f Citizen's Tide in Madrid, Spain on 23 February 2013. "No dictatorship." Millions in Spain are now at risk of poverty, with ROAR Magazine saying that Oxfam projects that some 18 million Spaniards (almost 40 percent of the population) could face a life of destitution by 2022. On Friday, Spain badly missed the 6.3 percent of GDP target for 2012 with a result of 10.2 percent, so things can only get worse for the people. Luis Mora, a construction worker in Madrid told AFP, "We have come because of it all - unemployment, corrupt politicians, the young people who have no future - it's a combination of everything." The video above shows some young people being arrested by police during the demonstration. RT and photographer Erwin Sarkisov have some impressive photos of the event.